The symbol I have chosen is one you may think you know already—a rose. This symbol generally conjures up ideas of beauty and love. But this rose is a rose of Sarajevo. They are all over the city in public areas and are the marks left by exploding shells during the Bosnian war 1992-96, then filled in with red resin. Over 470,000 grenades and shells fell on Sarajevo during the siege; 50,000 citizens were wounded and 10,650 were killed, 1,601 of them being children. 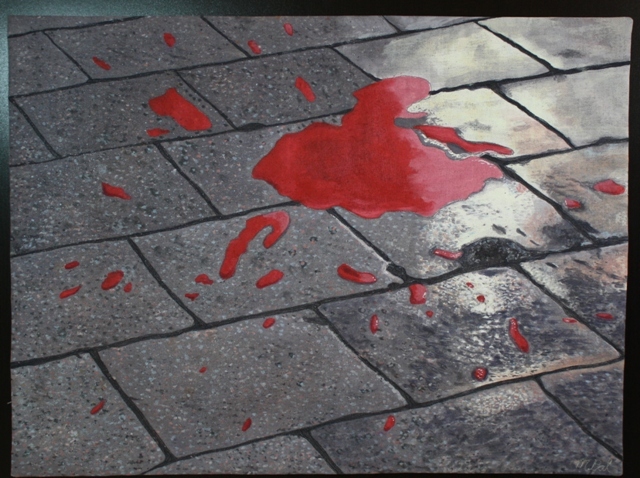 What this rose represents is the death of an ordinary civilian, possibly a woman or child, who was merely standing in the street or perhaps shopping at a market or filling a bottle of drinking water when a shell exploded; it is a sign of remembrance, like our red poppy, and represents the innocents against whom these atrocities were committed. But for me, it is a powerful symbol for peace and a caution to us all. It is a reminder that human beings “just following orders” will kill unarmed people simply to fulfill the desires of a politician seeking glory, riches, and power, with no regard to the cost to humanity. That war has ended but the problem continues. Yesterday it was Sarajevo; today it is Syria. I painted the quilt with Setacolor paints and quilted densely in the mortar between the stones. It is based on a photo I took in the marketplace but the rose is a composite of several I saw when visiting the city last month. Sometimes symbols provoke visceral responses. We forget. Profound. This is very powerful and moving Mary. Hope and destruction in one symbol. Your visit inspired a great piece of work Mary. Not easy for those of us living in peaceful coutries to comprehend. Symbols are designed to connote in a nano-second volumes of words...yours certainly does. Very moving. Thanks, everyone. I'm so thankful you all *got* what I was trying to express! And thank you for letting me know. I am still at a loss for words to describe the impact of learning so much about the horrors of that particular war. I know I need to post something on my own blog about it, and by next week I will have all my tasks under control and plan to do just that. Until I do, I think it will continue to haunt me.